We had a shop request these because they saw us using them at market in Houston. We packaged the patterns together in a bag, tied with jute or raffia and added the tag. Click on the picture to download the pdf file to print. Enjoy! 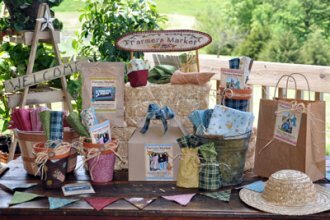 Kelly created this helpful Happy Harvest Craft Idea Sheet (wholesale version) to help you extend the use of your Happy Harvest fabrics, and also attact crafters to your quilt shop! We hope these freebies will help you sell more Wooden Bear fabric, by giving your customers more great ways to use the fabric! 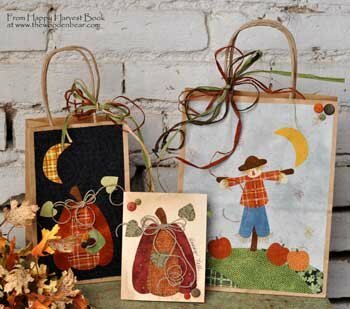 To print the Happy Harvest Craft Idea Sheet to hand out to customers (retail version), click here. This is an idea sheet that I gave away at schoolhouse in Kansas City this spring. 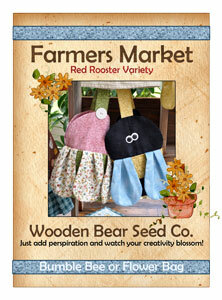 We hope this will give you ideas for marketing your Farmers Market fabric, or at least inspire ideas of your own! Click here for the printable idea sheet! 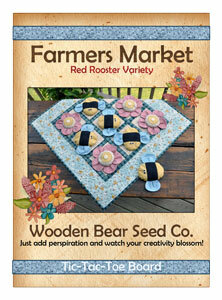 Seed Packet Graphics for Kitting Farmers Market Projects! I have designed FREE seed packet graphics (seen below) that you can print to use for kitting any of the projects from the Farmers Market book (Released July 2012), or the free projects from Red Rooster that you should receive when you order the fabric line! This makes kitting a snap! Read the Market Idea Sheet at the top for ways to use these graphics. The seed packets are laid out four per sheet, so there's no wasted paper. Print quality is best when you use a good cardstock paper. I used Epson Premium Presentation Paper Matte that I purchased at Officemax. Seed Packet Graphic for Kits! 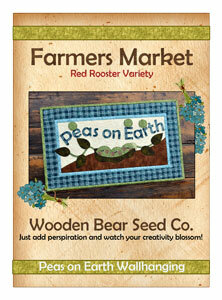 Click here for the printable seed packet sheet for the Peas on Earth quilt from my book, Farmers Market! "Bumble Bee or Flower Bag"
Click here for the printable seed packet sheet for the Bumble Bee or Flower Bag from my book, Farmers Market! Click here for the printable seed packet sheet for the Ladybug or Sunflower Bag from my book, Farmers Market! 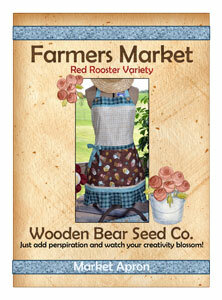 Click here for the printable seed packet sheet for the Market Apron from my book, Farmers Market! 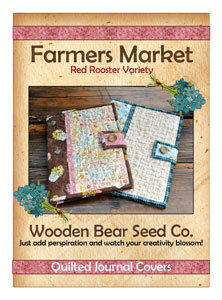 Click here for the printable seed packet sheet for the Quilted Journal Covers from my book, Farmers Market! Click here for the printable seed packet sheet for the Tic-Tac-Toe Board from my book, Farmers Market!